ASC is one of the first, licensed service providers of iPSC and CRISPR/Cas9 technologies, and provides the best iPSC disease modeling service on the market. (eg. Catalog number from cell despositary, morphology,growth, if the cell line has been genetically modified). Are the cells normal karyotype(diploid)? Have you transfected these previously? Can cells be expanded from a single cell? How often do you split the cells? 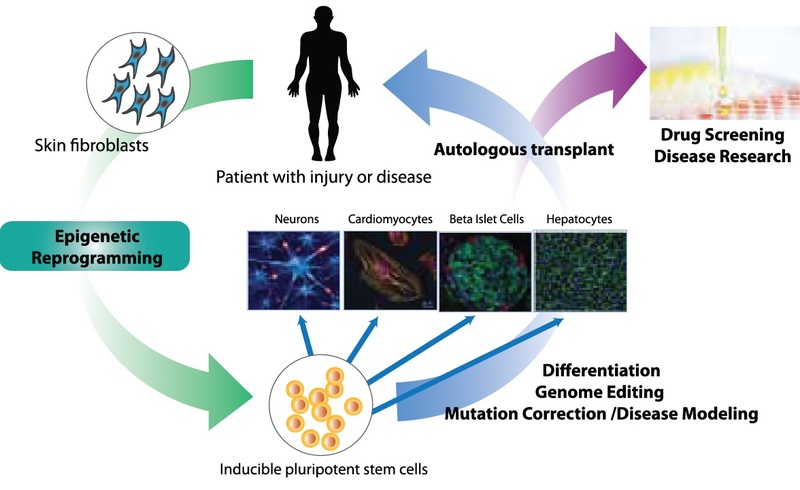 Induced pluripotent stem cells (iPSCs) derived from healthy patients or those with injury or disease provide an unlimited, isogenic source of cell line models, especially since they are amenable to genome engineering using CRISPR/Cas9 and other technologies. An added advantage of using iPSCs is the ability to induce differentiation into specific tissue lineage(s), thereby providing a consistent source of physiologically relevant cell line models for research and screening purposes. You need to provide your source cells, iPSCs, or you can start with Applied StemCell’s own iPSCs. Applied StemCell will genetically modify the iPSCs according to your specifications using CRISPR/Cas9 technology. Provide 1 x 10^6 cells of your iPSC or choose a cell line from ASC's iPSC catalog. Source cells can be fibroblasts, PBMCs, or other biosamples. Applied StemCell offers CRISPR/ Cas9 modifications of other cell lines or complete kits to do it yourself. Other services we offer include reprogramming of patient fibroblasts or blood cells to create patient-specific iPSCs, further differentiation of cells, and phenotype analysis. Goal: The purpose of this project was to genetically introduce a GFP reporter gene into human iPSCs at a specified locus "A". The gRNA candidates for each gene were selected based on the proximity to the knock-in sites and off-target profiles. Each gRNA was cloned into a Cas9 gRNA expression vector, sequence verified, and transfected into a model cell line. They were subsequently harvested for PCR amplification. An in vitro SURVEYOR assay was performed on the PCR product (Figure 1). The gRNAs that produced the desired NHEJ frequencies were then used for the transfection studies (Figure 2). Figure 1. SURVEYOR assay for gRNA activity in model (K562) cells. A donor vector was designed to provide the intended modifications via homologous recombination mechanism. The 5’ and 3’ homology arms, together with T2A-GFP-Lox-Puro-Pox fragment were subcloned into a linearized backbone vector, and sequence verified. The gRNA plasmid, donor plasmid, and Cas9 plasmid were transfected into Applied StemCell's episomal human iPSC line. Single cell colonies were screened by genotyping (Figure 2). The gRNA plasmid, donor plasmid and Cas9 plasmid were transfected into Applied StemCell's episomal human iPSC line (Cat# ASE-9202). Single cell colonies were screened for genotyping (Figure 2). Figure 2: PCR genotyping screening of GFP knock-in at locus "A". Three sets of PCR primers for each knock-in line were designed to amplify PCR fragments flanking left homology region (5 arm), right homology region (3 arm), and reporter gene insertion region (M) (to identify homozygous clones). Both Clone#1 and 2 were homozygous as attested by absence of PCR band (when compared to WT). Goal: The goal of this project was to correct a point mutation found in a mutant allele of a gene in patient derived iPSCs. The point mutation was corrected using CRISPR/cas9 by co-transfection with Cas9/gRNA vectors and a single stranded oligodeoxynucleotides donor (ssODN) into the iPSCs. The gRNAs were designed and tested based on the proximity to the mutation seen in the mutant allele and a NHEJ frequency using an in vitro SURVEYOR* assay (Figure 1). The ssODN was designed to replace the mutation with wildtype sequence using homology directed repair. Off-target analysis was also performed for each gRNA. Figure 1. gRNA in vitro validation. Red arrows indicate positive bands generated by Cas9/gRNAs. 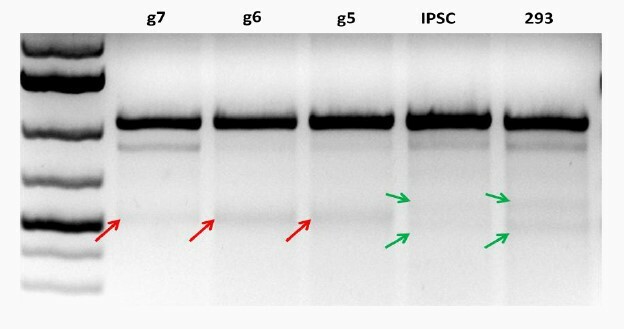 Green arrows indicate two background bands in either unmodified iPSC or wildtype HEK293 cells. Single clones were genotyped with genomic DNA PCR and then sequenced. One corrected clone was identified and confirmed by sequencing (Figure 2 and 3). Figure 2: Sequencing result of corrected clone (CTG > CCG). Red arrow indicates the nucleotide correction from a CTG to CCG. Figure 3: Alignment of corrected clone sequence (CTG > CCG). Point mutation is the top sequence while the corrected variance is the bottom sequence. Two silent mutations were introduced by donor ssODN (CGC > CGT, GGG to GAG). Goal: The goal of this project was to generate a frameshift knockout mutation in Applied StemCell’s human iPS cell line using CRISPR/Cas9 to deliver knockout iPSC clones. Applied StemCell’s iPSC line was used for this study (catalog # ASE-9202). The gRNAs were designed to target the early exon (exon 1) to generate the frameshift and were validated similar to case #1 (data not shown). After transfection, the iPSCs were screened and cultured. Isolated individual colonies were picked and allowed to expand. The genotyping strategy employed gel analysis of PCR amplification products from the exon 1 region straddling the gRNA cut site (See Figure 1). For verification of a frameshift mutation in the gene of interest, clones producing 551 bp PCR product was indicative of a 22 bp deletion of exon and were subjected to sequence analysis (Figure 2). Figure 1. Genotyping analysis of KO iPSC clones. PCR amplification products straddling the gRNA cut site in exon 1 were run on a 2% agarose gel. The presence of a 551 bp PCR product identified clone #6 as an iPSC line with a 22bp deletion. Lanes containing the 573 bp PCR product do not have deletion and are similar to wildtype (wt). Figure 2: Sequence confirmation of KO clone. a) Sequence confirmation of clone #6. The vertical line in the histogram indicates the new sequence generated by the 22 bp deletion. b) Sequence alignment between wildtype and clone #6. Selvan N., George, S., Serajee, F. J., Shaw, M., Hobson, L., Kalscheuer, V. M., ... & Schwartz, C. E. (2018). O-GlcNAc transferase missense mutations linked to X-linked intellectual disability deregulate genes involved in cell fate determination and signaling. Journal of Biological Chemistry, jbc-RA118.